LG Electronics' DLE8377WM is a new type of electric dryer that takes advantage of technology, particularly in terms of "touch and go" features. Its 7.3 cu. ft. stainless steel drum is able to hold massive amounts of laundry, paving the way for quick laundry time. The DLE8377WM is built with an LCD Display panel and intuitive control buttons for easier machine operations. The Sensor Dry System automatically suggests a setting that is convenient for the type of clothing. The user can also use his own custom setting, provided that his setting is ideal for his clothes. There are various drying programs to choose from that focus on the different needs of garments. Sensors will monitor the drying process and change settings that pose problems for the clothing and the machine. Temperature and drying levels can be customized when drying special articles of clothing. Users have the option to save their own preferred cycle settings. 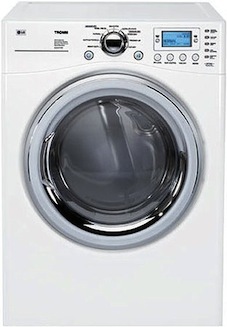 The dryer is supported by four adjustable legs to keep it level whether on the ground or when stacked with its washer. An installed pedestal is also available to support the dryer. Time Displays and Indicators will show when to take out the clothing and automatically shuts down once the drying process is finished. Safety is the priority of this dryer, constantly ensuring that every process poses no harm to the user or to the garment. (WxHxD) 27" x 38 11/16" x 30"
The DLE8377WM can fit in any household because it is easily stackable with other types of washers. A drying rack can be found below the actual dryer to support the machine and hold other laundry items. The controls and buttons are easily understandable. Advertisments and promotions about the model are not reliable. The level of dryness of the clothing depends on the amount that is put inside the drum. Its many features and cycle programs contribute to its large cost.